Essentials by Ellen and Honey Bee Stamps! Today I am combining some of my favorite stamps and dies from Honey Bee Stamps and Ellen Hutson! I might have gone on a bit of a crafting spree lately, I was having so much fun with the new releases from both companies (and some of their older releases as well) and, well, tis the season for crafting! Using the Chibitronics was a lot easier than I had expected and it was so much fun making a card that lit up! Next I have a couple of DIY Gifts that would be great for your holiday gift giving. These were both SO simple and so quick to make. For the wine basket I purchased the decorative basket from Michael’s craft store for under $5. I heat embossed the Essentials by Ellen Fat Pants sentiment from the Fat Pants stamp set and tied the tag around the top of the basket with some red twine. Popped in a bottle of wine with some tissue and now its all set for a quick holiday gift. Know someone with a sweet tooth? Try filling a mason jar with candy like I did with my snowman jar here. I just took a piece of cardstock and did some simple ink blending around some snowy hills. I stamped some snowflakes from the Honey Bee Stamps Flakey Friends stamp set. From the same stamp set I stamped out the snowman and die cut him with the coordinating dies. For the tag I heat embossed the sentiment from the Essentials by Ellen Holly Jolly stamp set and tied the tag around the jar with some Doodlebug twine. I think this would make a great gift for a teacher or coworker. Next up is a fun way to present a coffee gift card. This cute little bear is from the Essentials by Ellen All inside stamp set (and matching die). I gave him a big cup of coffee from the Oh Frappe set and popped him on an action wobbler so he bounces inside the MFT decorative circle cut out. I stamped the background with the same stamp set and the sentiment is a combination from this stamp set and the new Honey Bee Stamps Sending You sentiments. For the inside, I stamped the”just for you” and hearts from the Sending you stamp set and heat embossed with WOW rich pale gold embossing powder. I cut the largest heart from the Essentials by Ellen Folk heart die set and put a bit of temporary adhesive on the gift card and stuck it to the stamped heart. I Glued that to the back of the card and with adhesive on either ends of the strip I laid that over the gift card. 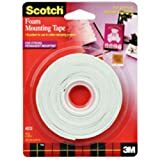 I think these are great to have on hand, especially around the holidays for quick gifts! Another great thing to have on hand is some gift bags. I Love the WRMK Gift bag punch board and I thought that the Essentials by Ellen leaping deer die would make the perfect window for a gift bag. This was another very easy to make project. I cut the bag according to the punch board directions and before I adhered anything I die cut the front of the bag with the leaping deer die. I stamped and heat embossed the JOY sentiment from the Honey Bee Stamps Merry and Joy sentiment builder stamp set. I took a piece of vellum and glued it to the inside of the bag, creating a little window. I finished off the bag with some sequins and that ribbon you see was a gift in my last Ellen Hutson order! They are just so sweet! 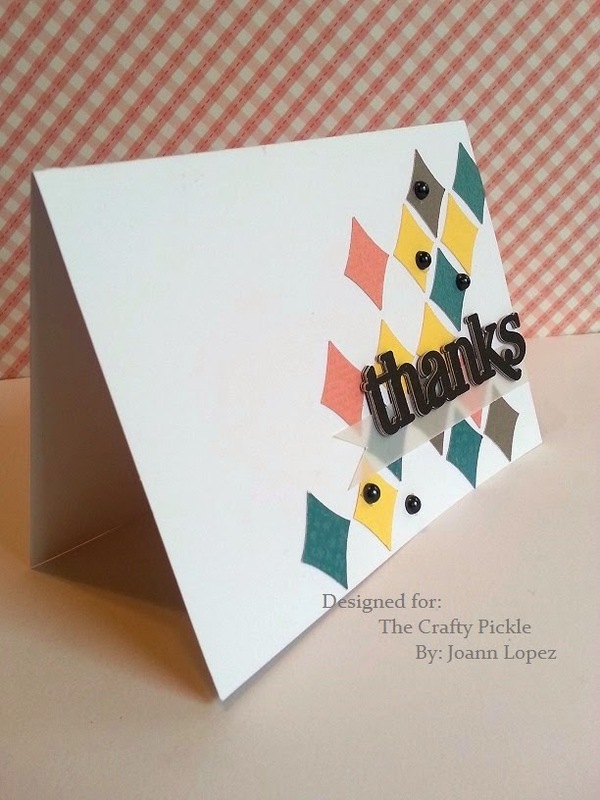 I also created a fun die cut inlay card with the new Honey Bee Stamps Thanks and giving die set. You can see that card and more on the Honey Bee Stamps blog HERE, but below is a sneak peek! Whew! That was a lot of projects to share! I am so glad you kept on reading because one lucky reader is going to win a $50 gift certificate to EllenHutson.com! How do you win? Easy Peasy! Leave a comment here, then pop on over to the Ellen Hutson classroom and leave a comment there too and another stop to HoneyBeeStamps.com and leave a comment there and you are entered to win! Supplies used are found below. 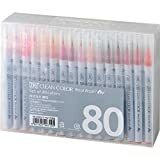 (affiliate links provided where available). Hi, Joann here. Thanks for stopping by! 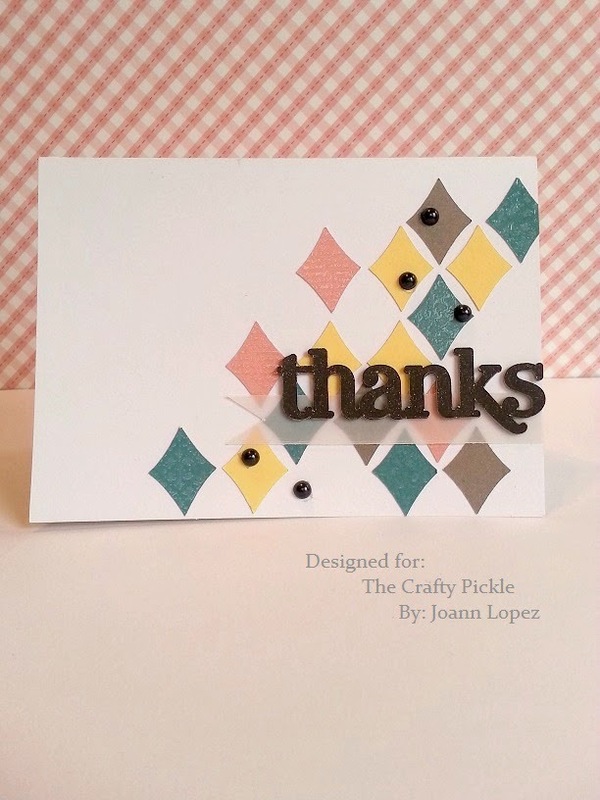 Today I have a quick and easy thank you card using the CTMH Artiste Cartridge. I cut several of the diamond image (pg. 49) out of some different colored card stock and clear embossed a few of them using the Honeycomb Flair to add some texture. I randomly placed them to create a fun background for my card. I then cut “Thanks” (pg. 65) for my sentiment, 4 times and stacked them on top of one another to add dimension and placed it on top of the banner (pg. 35) in which was cut from vellum. I finished off my card by adding a few adhesive pearls. That’s it, hope you liked it and as always, thanks for stopping by! Don’t forget to check out TCP Close to My Heart page! 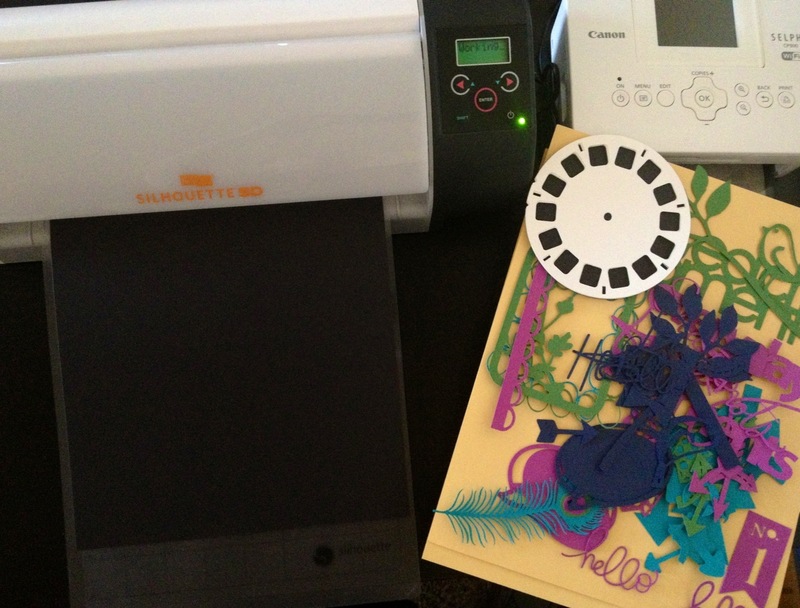 Today I gave my little silhouette machine quite a workout. I am making some custom project life cards this weekend for the Feb. Studio Calico swap. I have the older version of the silhouette (the SD) which is now revised into the silhouette portrait. Although I would love the 12 inch cameo I can’t see spending all that money when my sweet little machine is going strong. It truly is amazing how far die cutting has came. I still remember coveting my pebbles in my pocket templates and hand cutting all my letters for titles to my pages. 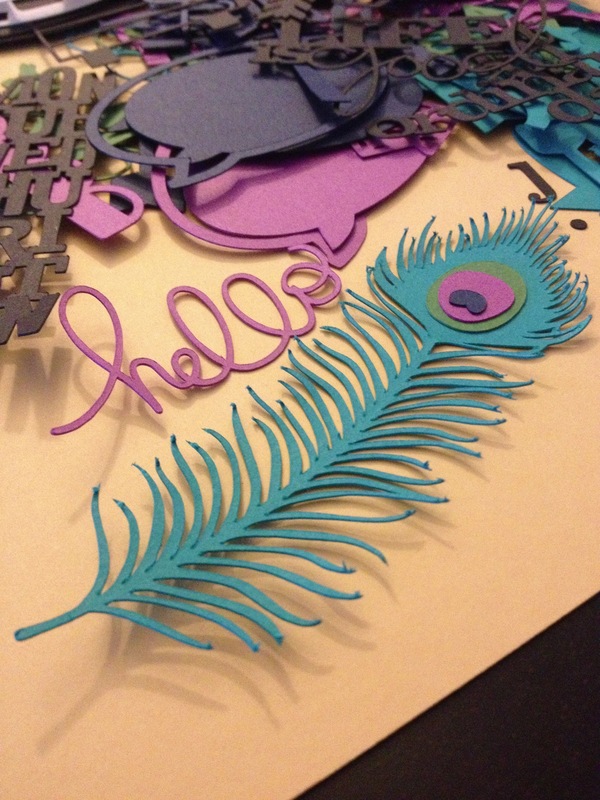 I will be transforming these piles of cut beauties (isn’t that peacock feather adorable?) into cards and posting them here on my blog very soon! Have a great weekend everyone!